After almost one year of no beading and crazy upside-downs in my life (finally more ups than downs), I lost control of my credit card and made agin a big bead order. Ok, not so big, but enough to get inspired again to squeeze some time to sit on the table with thread and needle. Was supposed to be a unicorn and needs still some details adjustments, but I am happy to welcome back my muse..hope she will stay longer this time. Dear Syl, I'm so happy to see you again between beads!!!! 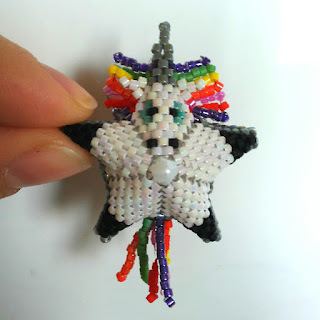 I love your starry designs and it makes me happy that you've made a new pattern!